President Bush presented his plan on climate change on Thursday. SILVER SPRING, Md., Feb. 14  President Bush announced his long- awaited plans today for slowing the buildup of gases linked to climate change and for cutting power plant pollution. His speech, made this afternoon at a government climate and oceans research center here, elicited clashing choruses of criticism and praise from advocates and politicians arguing over the best way to cut emissions of so-called greenhouse gases while minimizing the burden on the economy. Mr. Bush made it clear that, for him, the economy came first, not just for its own sake but because, he said, a thriving economy was necessary to build wealth that could be used to improve conditions on the planet. "My approach recognizes that economic growth is the solution, not the problem," he said. With his address, Mr. Bush essentially provided his answer to an international treaty intended to lower emissions of carbon dioxide and other heat-trapping gases that his administration rejected in March. At that time, he also abandoned a campaign pledge to cut power-plant emissions of carbon dioxide and three other pollutants. Not until now has his cabinet been able to agree on substitute proposals. The treaty Mr. Bush rejected, the Kyoto Protocol, has been agreed to but not yet ratified by almost every other industrial power and developing country. It would require prompt and mandatory reductions by 2012 in gas emissions to levels well below those in 1990. Mr. Bush rejected the treaty saying it would burden the American economy and unfairly exempt major developing countries. The plan Mr. Bush announced today would rely on voluntary measures only and allow gas emissions to continue to rise, with the goal of slowing the rate of growth. Utilities and energy companies expressed support for Mr. Bush's plans through their trade groups. Environmental campaigners expressed dismay, including some Greenpeace demonstrators who stood outside the Commerce Department building waving wads of fake dollar bills and a mock climate- action plan stamped in red with the words "Exxon-Mobil Approved." On the climate, the administration wants to stick with inducements instead of requirements, using tax breaks and the prospect of a future trade in emissions credits to encourage industry and individuals to trim releases of the warming gases. But in trying to minimize the costs, his critics said, Mr. Bush had settled on a strategy that would provide few results, saying that some limits on emissions would inevitably be necessary. By 2012, Mr. Bush said, his goal would be to nudge the curve of emissions down enough to save 500 million metric tons of carbon dioxide  the equivalent "of taking 70 million cars off the road." Mr. Bush said he planned to promote this measured, voluntary means of dealing with climate change in visits to China, South Korea and Japan next week, saying that it was important to find a way to encourage developing countries to join rich ones in reducing the growth of the so-called greenhouse gases. Japan has strongly supported the Kyoto treaty, which was negotiated there in 1997. But Japanese officials have been eager for some sign of action in the United States before pursuing its ratification. Mr. Bush said China, India and other large countries with fast-growing economies were already the dominant source of warming gases. "It would be irresponsible to absolve them from shouldering some of the shared obligations," he said. The United States remains the single largest producer of greenhouse emissions, generating about 20 percent of the global total. Another central element of his climate plan would be to expand a system created under his father's administration in which businesses would voluntarily report their emissions and be granted credits that could later prove valuable if an emissions trading system were adopted. He only hinted at that prospect, though, saying that only after 2012 would there be an assessment of how the country was doing without concrete caps. 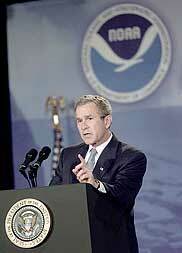 On cleaning up power plants, though, Mr. Bush said a voluntary system would not do. In Bush's view power plant pollution poses a clear health risk, while the threat of global warming remains less certain. Echoing recent bipartisan proposals in Congress, he called for deep mandatory reductions in three kinds of pollutants from power plants  sulfur dioxide, nitrogen oxides, and mercury  all of which contribute to health problems and harm the environment, but play no significant role in global warming. Proposing legislation that he has called "a new Clean Air Act for the 21st Century," Mr. Bush said that sulfur dioxide would drop 73 percent by 2018, nitrogen oxides, which spawn smog, would drop by 67 percent over the same span, and mercury by 69 percent. He proposed a fundamental redesign of existing plant regulations, ending a jumble of individual restrictions on various compounds. As with other proposals evolving in Congress, his plan would allow industries to achieve reductions by trading emissions credits. Environmental groups and Democrats, including Al Gore, pounced on Mr. Bush's plans, saying they followed industry's dictates and would result in little or no improvement beyond existing laws and trends. David Hawkins, the climate policy director for the Natural Resources Defense Council, a private group, said the plans for climate and power plants mirrored the views of the Energy Department and companies that sell or use large amounts of coal, oil, and other fossil fuels  the main source of carbon dioxide. "Every number, every date, are the numbers and dates that they advocated," he said. But others involved in the debate were more content. Kevin J. Fay, the executive director of the International Climate Change Partnership, which represents multinational manufacturers who support some climate controls, said Mr. Bush's proposal was a starting point for moving ahead with legislation and new environmental rules. "The most significant thing is that they now have entered the dialogue with a fairly well-rounded proposal," he said.